So last week I took my first trip to Singapore. It has to be, by far, the cleanest place I have ever visited. Cleanliness of their country is so important to them that it is illegal to buy gum! Thankfully, they did not check my bag upon entry!! We landed at Changi airport early Monday morning and checked into the Regent Hotel for a quick shower before heading into the plant in Tuas, the industrial area of Singapore - with manufacturing plants from every company you can think of. We worked all 4 days prepping the plant for an FDA audit. But the most memorable part of the trip was the food. a) They do not know how to make coffee. It looks and tastes like tar. Even with cream and sugar. But, I guess if you don't drink it, you don't know how to make it....BTW, the tea was great. c) Very few people there own cars - most take public transportation or taxis. This would be due to the $70,000 certificate fee that each car must have every 10 years. Imagine! Having a 10-year old car and having to pay $70,000 to keep it! Or worse, buying a new car and having to pay for the car, taxes, duties plus $70,000! I figure you would have to take 10 taxi rides per day for 10 years for you to break even. Wow! d) And then, after you have a car, you have to buy gas. Gas that is so much more expensive than the neighboring country, that people try to drive over into Malaysia to buy gas. 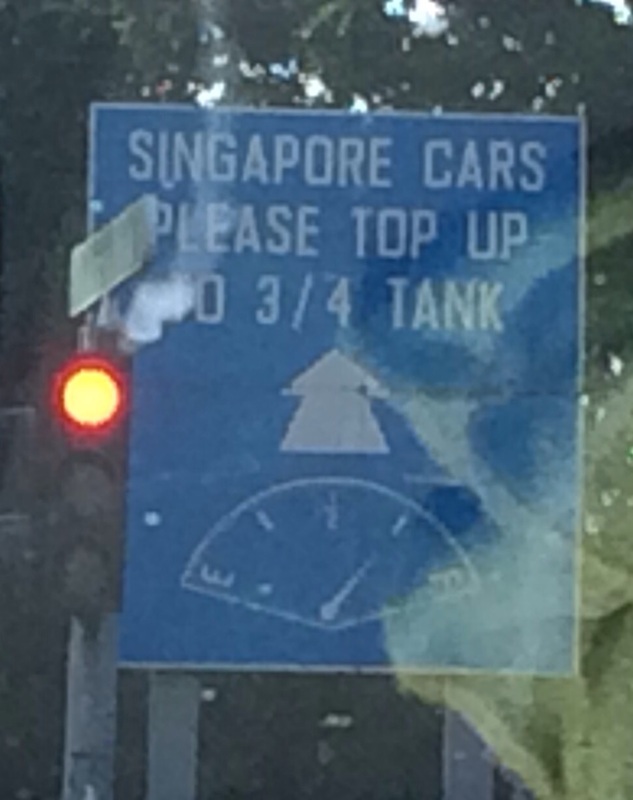 So many, that Singapore will now not let you leave the country unless you have 3/4 of a tank of gas!! Amazing! e) Apparently, although I am not a fan of either beer or lemonade, I like them mixed.... 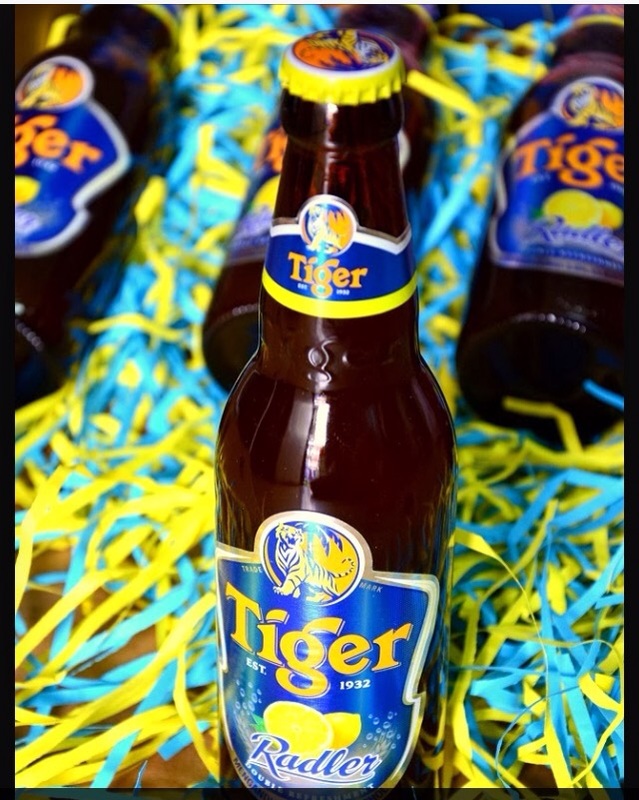 I was able to sample a drink called Tiger Radler. It is a mix of beer and lemonade. Very refreshing... like a Blue Moon without the hops. f) I absolutely love the Singaporean dish of black peppered crab. I mean how can you go wrong with a huge crab fried in black peppered oil! Yum!!! Probably, the most memorable dining experience was at a place called Long Beach at Dempsey Hill. First of all, Dempsey Hill is a food-lovers dream. It is an old army barracks turned into (at least) 13 rows of restaurants and bars. At Long Beach, we had fried prawns, squid with thai chili sauce, thai steamed fish, chile crab and (the house special) the black peppered crab. So good, but so much food! 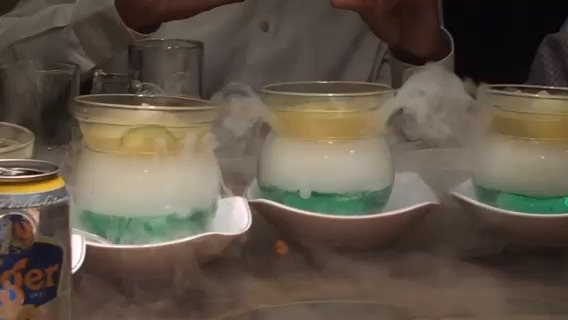 That was followed with the dessert of aloe vera lemongrass jelly served over dry ice. It was such an experience! They called it jelly...it was jello! On our last night, before we departed, we went to Clarke Quay, a neat outdoor dining area on the Singapore River. Although I spent most of my time in Singapore at work, I found the experience completely enjoyable. It was a beautiful country with wonderful food - everything one could ask for in a gridskipping experience. Newer PostGetting Ready to Get Ready! Older Post6 Month countdown begins.